My fourth trip here and already it's off the charts. 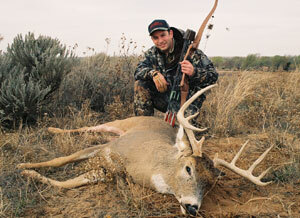 I hunted a stand called "Ken's Tree" where Ken Beck (Black Widow Bows) shot a huge buck three years ago. At first light I noticed a doe feeding her way in. At the same time a flock of gobblers flew down from their roost and fed their way in as well. I knew it was going to be a good morning. As the sun grew higher off the horizon, I noticed another doe moving in, but before she could get to me a buck, appearing from nowhere and chased her off. As they disappeared into the sand hills, movement caught my eye behind me and another buck was working over a bush. Both bucks where young and not shooters. The first doe was still in front of me and she whipped her head around and looked back toward the trees. 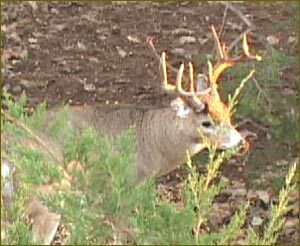 From a 100 yards away I could see him coming, and he was a dandy. 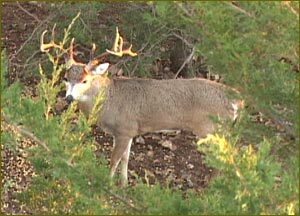 As he got closer, he appeared to have a heavy, wide rack with short points, but he had a kicker hanging off the side of his left beam. I really liked this buck, especially because of the mass and the character of his rack due to that abnormal growth. 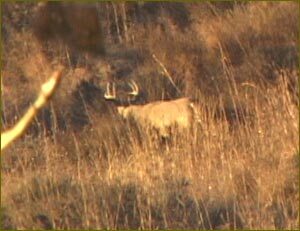 Unfortunately, he moved on past and out of range, sweeping wide and downwind of the doe - who was still watching him. I turned my video camera on and tried to film him walking away. Evidently he had never seen the doe under my stand because he turned ninety degrees and headed right in. My bow was ready and I started giving his rack a hard look. I debated shooting this early in the trip, but the old adage haunted me (don't pass up something the first day you'd shoot on the last). I picked up my bow. The buck fed in a poor angle for quite a while. Then he turned quartering away at 15 yards. I picked a spot, drew, held and shot. My arrow appeared to have missed the deer. What the heck? I said to myself. Everything felt great and the shot was a lay-up. The buck ran off and snorted for a while before running off into the sand hills. An hour later I watched a nice typical move off to my right. I couldn't see him all that well but he looked good too. When Kent picked me up I told him I had choked. We replayed the video footage and to my surprise you can clearly see the arrow had deflected off the tip of a cedar branch. There it was, plain as day in the video but I never knew it when I shot. As we were watching the video, Kent Woolfolk's truck pulled up with Rob Register (Georgia) and Rob's buck. He had made a great shot last night but he was not 100% sure of the hit, so they let it lay. They found it 50 yards from his stand. The buck was a solid P&Y buck, Rob's biggest and he was pumped. 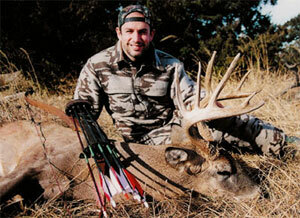 He had booked this hunt after watching our live hunt in 2001 and here he was with his best buck ever. We were all excited for him. The weather here in South Kansas today was HOT. I did not bother to hit the stand until 3:30 PM and never saw a deer. That was OK with me, after this morning I was totally satisfied with my first hunt here. The success from the last two years brought me right back here again this November. As you may recall, in year one we hunted the 3rd week of November but moved that up to week two last year. There were plenty of big bucks and they were not quite as spastic. This year we're hoping for the same. This hunt is strictly a fair-chase hunt. No fences or purchased/genetically engineered deer. The land we are hunting are large tracts of tightly controlled private lands owned by Kent Jarnagin and Kent Woolfolk of Cimarron River Outfitters. As always, we will be bringing the hunt to you as it happens, day by day. We are in a very rural section of Kansas, with poor phone line speed - video footage will be difficult - but we'll try. 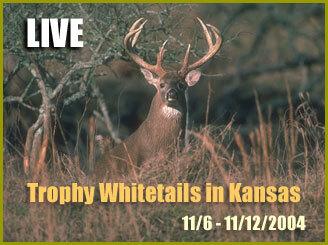 Our Kansas bowhunt takes place in Southwest Kansas with Kent Jarnagin of Cimarron River Outfitters.